Students investigate the relationship between linear and angular velocity. 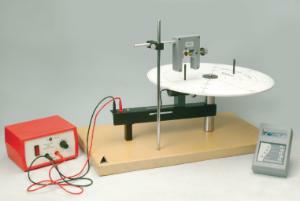 Easy to operate, this student-friendly apparatus consists of a 40 cm wide disc driven by a motorized wheel. The disc’s moveable pegs can be positioned at a specific distance from the center, and a photogate reads the frequency of the pegs when placed at different positions on the spinning disc. When students measure the frequency of the pegs at different positions but a constant rotation, they find the angular velocity to be consistent while the linear velocities are different. The drive motor can be positioned near the center of the disk, causing a faster rotation, or near the edge, which causes a slower rotation. Ordering information: This kit includes an activity guide. It requires the Photogate System and Power Supply, available separately.